Hello my friends, today is a two-fer day! Not only am I bringing you a delicious recipe for Chile-Braised Short Rib Tacos, but I also have a story for you! Say what? A recipe AND a story? Yup, it's your lucky day. This post is sponsored by the North Carolina Department of Agriculture & Consumer Services and I was compensated both monetarily and with product. However, the recipe and comments are entirely my own. So, once upon a time, 125 years ago to be exact, a preacher named W.L. Moore bought 120 acres in the Piedmont region of North Carolina, in a little town called Prospect. W.L., who was a Waccamaw Siouan Indian met and married Tootie Oxendine, a Lumbee Indian. He ministered at Prospect United Methodist Church and became the first headmaster of Croatan Normal School, an American Indian school that eventually became UNC at Pembroke, while Tootie became the first female Indian teacher in the area. The couple raised their family in this small town on the banks of the Shoe Hill Creek and Lumber River in rural North Carolina. Today, their descendants are teachers, farmers, and judges in Prospect. Eddie and Luther Moore, great-grandsons of Tootie and W.L., raised tobacco on their parcel of the family land for years until the winds of change convinced them that they needed to find other uses for their land. They began to grow corn, wheat, and soybeans and raised cattle on their land as a ‘hobby'. This hobby enabled them to use their land wisely and to know exactly what they were putting on their family's table each night. They were, and are, firm believers in eating as close to the land and as far from a lab as possible. When word of their pasture-raised, humanely-treated beef ‘hobby' got out, friends and family began to request their dry-aged cuts of beef. That's when, following in the footsteps of great entrepreneurs before them, they founded Moore Brothers All-Natural Beef and dove head-first into the cattle business. Terry and I met Eddie Moore at their store on a crossroads in Prospect, NC. The company is a true family-run business, with Eddie, his son Lee and brother Luther running the day to day cattle operations. Eddie's and Luther's daughters Ryan, Hannah, Carli, and Lenora run the company store. Eddie is understandably proud of the family run business that provides quality beef to several restaurants and natural foods grocery stores in North Carolina and South Carolina. 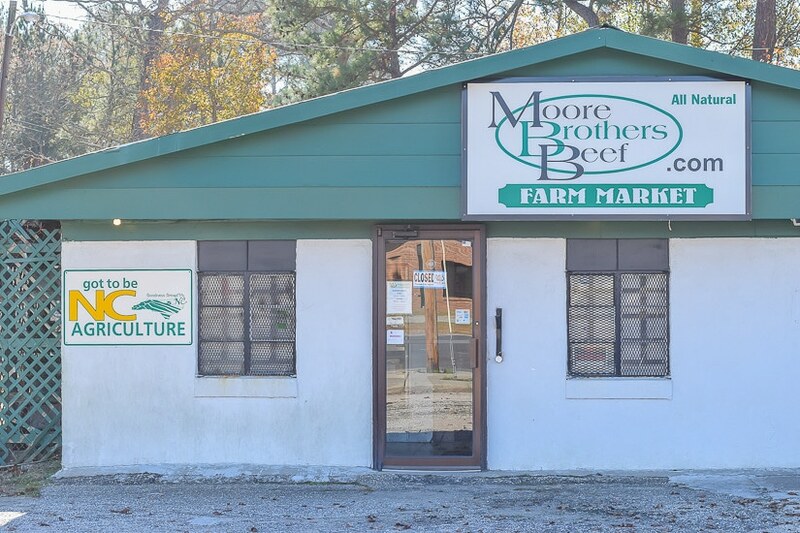 For those of you in the Produce Box delivery area, check for boxes containing Moore Brothers All-Natural Beef this spring and for those of you outside of North and South Carolina, Moore Brothers All-Natural Beef will also ship nationwide. If you want to feed your family as naturally and as close to the earth as possible, then Moore Brothers produces your kind of beef. The farm produces 95% of what their Angus and Simmental cattle eat. The cattle are free to roam on the 220 acres that comprise the family farm, both pasture land and wooded areas. They are pasture fed, being supplemented with small grains and hay only as necessary in the winter months. But most importantly, they are never given antibiotics or hormones; any sick cattle are removed from the herd. Not only do these conditions produce a healthier cow, but Moore Brothers Beef is then dry aged for 10 to 12 days. Naturally occurring enzymes break down the tough muscle fibers and connective tissues, rendering a much more tender piece of meat. The beef flavor is intensified due to the enzymatic and bacterial processes that occur during the dry-aging. So after spending the day with Eddie Moore, Terry and I came home with 20 pounds of various beef products (short ribs, ribeyes, beef bones, ground beef, hot dogs and sausage) and I knew before I left Prospect that day that I'd be making short rib tacos to share with you. I've been ruminating on how to prepare these short rib tacos for the past month. I know that the standard method is to slow cook them in a braising liquid for several hours, but I really wanted to roast these short ribs in the oven. Maybe my logic doesn't hold, but in my mind, I was hoping to focus less on the flavor of a sauce and more on the meat's natural flavor. I coated them with a brown sugar/spice rub, seared them to achieve a nice crust, spread chile braise over top and then let a low and slow oven work it's magic to create these tender and delicious short rib tacos. For the chile-braise, I used chili paste instead of chile powder. I easily adapted this recipe from Serious Eats using the dried chiles I could get my hands on (Ancho, Guajillo and New Mexico). However, feel free to use chili powder as indicated in the recipe. Beef Short Ribs coated with a brown sugar/spice rub, seared to achieve a nice crust, braised with chile sauce and roasted in a slow oven to let the heat work it's magic to create these tender and delicious short rib tacos. Prepare rub by mixing all rub ingredients together. Put the ribs on a cookie cooling rack on top of a jelly roll pan, cover with saran wrap and refrigerate overnight. The next day, heat 2-3 TB oil or bacon fat over a medium-high heat. Sear the ribs on all sides, about 2 minutes each side. Place seared ribs into oven-proof pan and set aside. In blender or food processor, place onion, garlic, chile paste, tomato paste, red wine, cumin and sugar. Process until pureed. Wipe out the pan you used to sear the short ribs if it needs (i.e. burnt pieces) and add 1 TB oil/fat. Add pureed chiles to oil/fat and saute for 3- 4 minutes. Evenly distribute the puree over top of the ribs, cover with aluminum foil snugly and bake for 3 hours, until tender and falling apart. Remove from oven, remove aluminum foil turn oven on to broil and place ribs 6 inches from broiler for 7-8 minutes. Pull meat off and serve with flour tortillas, cotija cheese, pickled onions and cilantro. Can easily be made ahead of time and reheated. It was all I could do to keep the family's collective fingers out of the pot. Suffice it to say that there were no leftovers. I mentioned at the get-go that this post was sponsored by the North Carolina Department of Agriculture. North Carolina has a very vigorous ‘Got To Be NC' program to promote all the wonderful, locally grown, raised and harvested products that our state produces. Now be honest, when you think ‘states that produce beef', North Carolina probably doesn't pop in your head. But North Carolina is home to many cattle ranches that offer beef in the niches of grass-fed, grain-fed, organic, non-GMO, heritage and certified animal welfare approved. Basically something for everyone! So check your local farmer's market and favorite restaurants, as well as on-line for Moore Brothers All-Natural Beef and other ‘Got To Be NC' products. I teamed up with several other bloggers to provide you with some mouth-watering recipes, all made with NC Beef. Check them all out here. 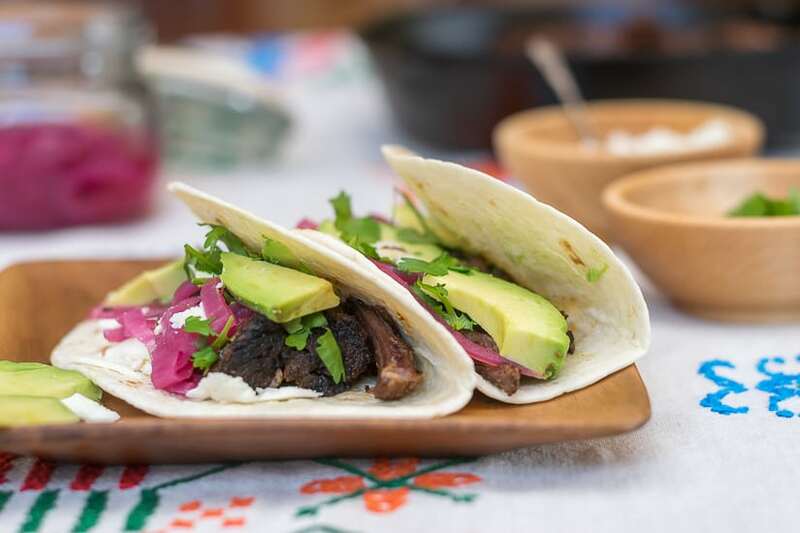 My goal today was to provide you with a great short rib taco recipe (check), a great, classically American story (check) and some information that you might not have known(check and check); unless, of course, you are some kind of savant chock-full of dry-aged beef fun facts. That's it for today my friends and thanks for stopping by to visit. I appreciate you more than you’ll ever know. And when you leave a comment…ah, it makes my heart sing! I have published printable PDFs of several of my most popular knit patterns and printables and have made those available to all of my subscribers. Come back and check every now and again. I will continue to add patterns and printables to this page as we go along. So, if you’d like to get in on the ‘subscriber benefit’ action, simply subscribe to Nourish and Nestle using the form on the right sidebar. It’s towards the top a bit. I have sent all my subscribers the link to the Subscriber Benefits Library, but if you missed it or misplaced it, drop me a line and I'll get it right to you. I love pickled onions, and avocados and tacos…whats not to love about this recipe?! I’m with you Wendie! Everything is better with avocados and pickled onions…And these tacos are the perfect food for them. Thanks for stopping by and visiting. Hi April, I really enjoyed getting out of my bubble and in to the world of farming. I was so lucky to have such a passionate and down to earth farming advocate to visit, that it made my visit all the more enjoyable. Fantastic post, Lynn! Makes me want to check out Moore Brother’s for myself–growing 95% of the food they feed their cattle right there *and* dry aging?! Wow!! The tacos sound wonderful. I do love short ribs, and anything wrapped in a tortilla checks all the boxes, so this recipe is right up my alley. Thank you so much for being a part of the blog tour! Hi Jenni, I do hope you do find the time to visit Moore Brothers. Eddie is such a passionate and down to earth advocate of natural farming. And I am pretty stoked about these tacos…already made them a second time! Oh YUM!! Your Chile-Braised Short Rib Tacos sound amazing! Love me some short ribs and you can’t go wrong with tacos! I really enjoyed reading about the history of Moore Brothers All-Natural Beef. Hi Kate! And thanks so much for swinging by. These tacos are so good (I’ve already made them twice in the span of a month) and I so enjoyed my visit. I’ve already ordered more meat from them through my local natural foods store. The Moore Brother’s farm sounds wonderful! I’m in Wilmington and Raleigh a lot so I’ll have to look for their beef! That brown sugar/spice rub sound like it would be perfect for the shirt ribs for these tacos! YUM!! Hi Angie! Next time you are in Wilmington, stop by Lovey’s on Military Cutoff! Who knows, I might just run into you there. I have to say that I am a convert…there really is no comparison with this more natural beef. Don’t you agree? I’ve already ordered more from Moore Brothers through Loveys. I love tacos! And your recipe is right on time! I think I’ll head to Seaboard 18 in Raleigh to see what they’ve come up with using Moore Brothers’ beef! Oh Nikki, I’m so glad you’re going to Seaboard 18. If it’s convenient, do let them know about the Moore Brother’s post…and good press for those great guys would be super. Next time I visit my daughter at UNC I’ll need to head to Raleigh and give it a try. Thanks for stopping by to visit. I made the short rib tacos a few days ago and they were great! There were 3 of us home the night we had them so I assumed we would have some leftover. Wrong! We all went back to refill our plates and ate every last bit! This recipe is definitely a keeper. Thanks for sharing it! Hi Heather, I am so glad that you loved them! I am getting ready to make them for a third time next week…that are a favorite in my family too. Really appreciate you swinging by and leaving your comment. It thrills me to know that others love this dish as much as we do. This looks so good!! I’d love to have you share it on our Taco Tuesday link up! I’ll pop over there and enter it on Tuesday. Thanks Helen. Your house must have smelled amazing while those ribs were in the oven! No wonder you had trouble keeping fingers out of the meat until meal time. Pinned! Good Morning Leigh, thanks for coming by. Not only did my house smell good, but the short ribs lived up to their olfactory billing! I’m looking forward to making them again in a couple of weeks for company…my mouth is watering at the thought. Wishing you a fantastic day. That looks simply amazing! My mouth was watering when I got to that photo of the skillet with all that tender and juicy beef. mmmm! You’ve got some skills. I love that the focus on grass-fed, grain-fed, organic, non-GMO NC beef. So important! Thanks for sharing. Trish, thanks so much for stopping by and leaving your kind comment. I enjoyed every minute of my visit to Moore Brother’s and was truly honored to be included in this roundup. And those short ribs are truly delicious and I think I’ll be cooking short ribs this way from here on out. Fabulous recipe and how great to learn about some NC farmers and their products. I love tacos and adding the pickled onions intrigues me. I like them so I bet I would love this version as well! Oh Beth Ann, If you like tacos and pickled onions, then I think you will love them. I am making them for the third time next week for my Game Night crowd. Lynn, I really loved reading about the history of this farm. So fascinating! And this taco recipe (with pickled red onions!!) absolutely knocks my socks off. I am not sure how I will ever be able to eat a standard taco again. Thank you for such an awesome two-fer post! You are ever so welcome Jenn! I really did enjoy my trip to Moore Brothers and have already special ordered some different cuts of meat from them through my local natural foods store. And that recipe…oh my it was so good. I am planning to make it for the third time when I have my game group over next week! oh man – I can taste these in my mind and my mouth is watering! Thanks for sharing on the Taco Tuesday link up! They are so good Helen…getting ready to make them again. And thanks for inviting me! I’ll pop by with another taco recipe soon. Gosh, your farm is beautiful! This recipe looks banging! Can’t wait to try it. Banging! I hadn’t heard that term related to a recipe before, but think it is very appropriate. Hope you enjoy it as much as we do. These look delicious Lynn, and I am big fans of local and responsibly grown food. My family loves anything wrapped in a tortilla so I think I need to add this recipe to our rotation. Thanks for sharing. Sarah, I think those meat-lovers in your family will love this recipe. I will be making it to serve to my game night crew this Friday… so excited to enjoy it again. Hi Sam, I know you will enjoy these short ribs! I am making them again for the third time this week and am already drooling thinking about them! Have a great day.